Fish Curry with yogurt, or Doi Maach, as it is known in Bengali, is a dish prepared during festive occasions. 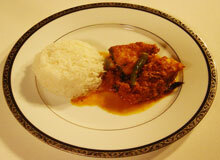 The curry is cooked with larger fishes like carp (katla) or hilsha (Ilish). In step one, the fish will be marinated and shallow fried in mustard oil. In the second step the spices will be fried with yogurt to create the sauce. Finally, the fish will be added to the sauce and cooked to complete the preparation. 1. Sprinkle turmeric and salt on the fish pieces and pat them uniformly all over. 3. Add the sugar and a little salt into the yogurt and mix them well with a spoon. 4. Grind the sliced onion, the ginger and the garlic pods together in a grinder to paste. 5. In a moderately hot pan, add about 3 tablespoons of mustard oil. 6. When the oil is hot to feel add the fish into the oil and fry each side for about 3-4 minutes. You may like to cover the pan if it splatters. Both sides should look well fried. 7. Remove the fish from the frying pan and keep them aside. 8. In the same hot oil add the Indian bay leaves. 13. Add the mixed paste of onion, ginger and garlic. 15. Add red chili powder. 18. Continue frying in slow heat till the whole mixture turns into a paste. 19. 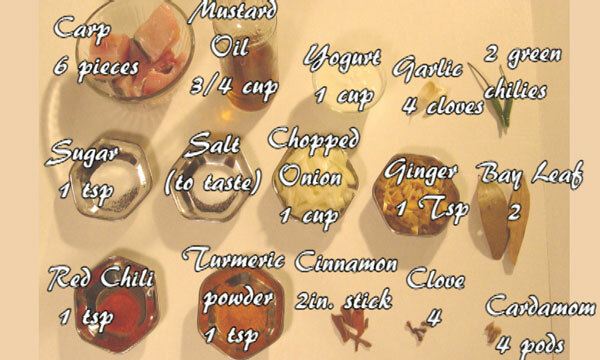 Start adding the yogurt one spoonful at a time and then mixing with the spices. 20. When three fourths of the yogurt is mixed, add the remaining one third all at once. 21. Stir them together till the mixture becomes semi dried and well cooked. 22. Add one cup of water. 23. Stir well as it comes to boil. 24. Add the fried fish into the gravy.25. Add two green chilies. 27. If the gravy looks dry, then add a half cup of water. 28. Cover the pan and bring to boiling for 2 minutes. 29. Open the lid and turn the fishes over. 30. As the gravy thickens remove it from heat. This completes the preparation. Serve the curry hot with steamed white rice.